Samsung Galaxy S4 tipped to chase iPhone 5 with March 2013 release – As I have stated several times before, the resources Android vendors are throwing at the market simply cannot be matched by Apple. Apple says: iPhone5 topped two million in just 24 hours, more than double the previous record of one million held by iPhone 4S. Of course, this does not take the full reality into consideration. For one, this is the release date on a product that has purposefully limited supply so as to keep demand stoked, or at least to exacerbate the perception of high demand. There’s no doubt that demand is extreme for the iPhone 5, but Tim Cook (CEO of Apple) is a supply chain guru by both training and experience. I find it absolutely untenable that Cook cannot forecast demand for his main product and primary cash cow better than that. This is the 5th or 6th iteration of the most important device that Apple sells, and a supply chain whiz can’t avoid sellout on the first day???!!! Come now. More importantly, the increase in sales of the iPhone 5 relative to the iPhone 4S is due largely in part to the increase in the smartphone market in general. I doubt very seriously if this device will be able to stem RIM's US market share slide, and they face a tough battle abroad, particularly in east Asia, one or the largest potential markets. Still, despite all mentioned above, I thoroughly applaud RIM for sticking to their enterprise security, something that the other players have yet to even develop to such an extent - RIM Refuses to Disclose Codes as BlackBerry Faces Indonesian, Saudi Bans. Click here to download ( Apple iPhone Profit Margin Scenario Analysis Model), and click here to subscribe. Starting next week I will produce substantial forensic analysis with sensitivity and scenario analysis for subscribers to give valuations for Google, Apple, Microsoft and RIM along a variety of market win/loss events. The same thing has actually been happening to Apple, with the same ignorance portrayed by the pundits due to strong fundamental performance in the here and now - just like RIM exhibited back then - see Empirical Evidence of Android Eating Apple!. I often scan the comment sections of many blogs and websites to get a feel for the readers' perspective. One premise I see espoused often is that Android is succeeding at the expense of Nokia, RIM and MSFT, and not that of Apple. Both I, and the facts, disagree with this notion. As it stands now, Android is literally eating Apple's smart phone market share, and as of last quarter - which does include a partial month of the big sellers from both the Apple (iPhone 4) and Android (Evo, Samsung Galaxy, Droid X) camps - Apple's phone sales are actually growing slower than the market is expanding. In comparison to the near parabolic growth of the last few years, it is evident that that growth is going somewhere. Where do you think it is going? The potential for lag in phone sales right before a major hardware upgrade should be taken into consideration, for there was probably a lull in Apple phone sales in anticipation of the iPhone 4 release, but the same can be said for the Android handsets as well (all around the month of June). Below is a graph showing the longer term trend of Apple market share in the smart phone space. It illustrates the explosive growth Apple has had through its iPhone series, and it also shows some seasonality (ex. lull before hardware upgrade season, etc.). As you can see, the growth trend, viewed either directly or as a moving average, shows marked downward momentum. Of course, it is highly unreasonable to expect a company to continue to grow at the pace that Apple has, but that is exactly what many Apple valuation models that I have come across have - literally hard-coded in. This is folly, in my opinion - particularly considering the effect of the Android competition that is already showing up. 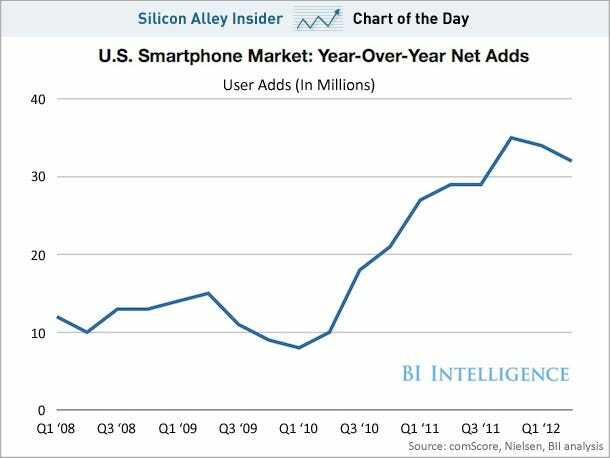 If you look closely, Apple's smart phone market share is already showing NEGATIVE growth! Since I know that the chart may be a little difficult to read at the tail end encompassing several years of data, I have taken the liberty to drill down to the past year to get a closer look. Remember, Android sales didn't really get started until 8 months ago, and the big surge didn't occur until the Evo/Droid X/Samsung Galaxy series were launched in June, July and August - most of which is not captured here. The same is to be said for Apple and the iPhone 4. Click to enlarge to printer size! and more importantly, Apple's smart phone market share is experiencing a very sharp downward trend as shown by both direct observation and that of the 2 period moving average.